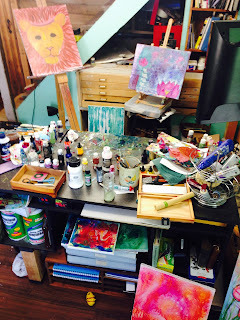 the studio is currently an active disaster! it is a tornado of color and canvas and i love it! i'm actively working on 6 large canvasses and 3 minis at the moment (omg, right?! ), which means every horizontal area is used for drying the really wet stuff. i have to be careful about the cat getting in my area, or there may be feetie-prints in my paintings. i also have to separate my paints and try to remember which painting has what colors. i suppose it's time to write these things down, but when your brain is being driven by the muse it's hard to stop to remember to do those silly things. 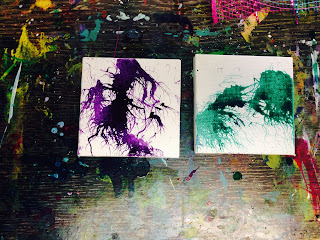 it's time to get more mini canvasses, too, as my last two are being experimented with. as i got into the technique i was using, i heard the name of these two in my head. and a split second later the same name came up in a song that i don't know. love the synchronicity of these things! and even more ideas have come to me. one is to bring a little prayer into some of my paintings. some full prayer, some just prayerful words. nothing too preachy or that screams of "scary religion" to some. but, i put a buddhist prayer on one of my lotus canvasses today and it really works. the serenity prayer would be a nice one, too. and some native american prayers i think would be cool. just shining more light into the world, which is so needed! as of this moment i have 10 finished paintings (finally finished, brand new, and mini) to put into the shop, but i'm not sure if it will happen this weekend or next. we have our grandtwins coming to visit from cross country this saturday and i know we will be too busy doting on them for anything else to be a priority. sunday we are busy helping friends move, and monday is the fourth of july. people most likely will not be waiting to see whats new but enjoying their time with family. last time i put something up in the shop and nobody liked it was fathers day, and the painting was my octopus, which i feel is my best painting so was shocked. it's still low on the likes compared to some of my more simple paintings, so i think timing is everything with this. either i hurry up and get them posted before saturday morning, or we will probably wait until next weekend. and who knows how many paintings i'll have by then!